Noises in the sky reported in Canada and Indonesia. 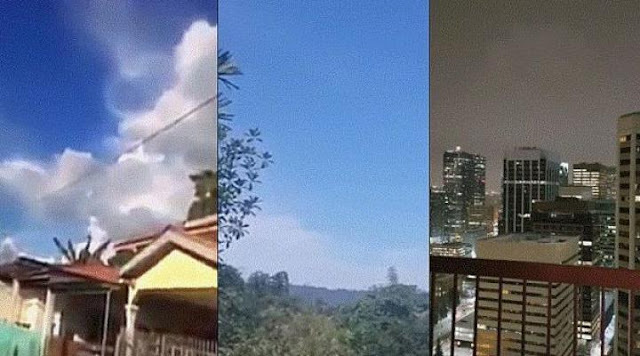 There have been multiple reports of bizarre noises being heard in the sky from places as far-flung as Downtown Calgary in Alberta, Canada and in various locations throughout the country of Indonesia in the space of the past couple of days. These noises have been reported in far-flung places of the world for a number of years now. Some witnesses from various locations have described the noises as being humming; others reference loud explosions and many reference the sound of grinding metal. Perhaps the most bizarre sound that is consistently reported to be heard during these events is the sound of a trumpet which some people have interpreted to be apocalyptic like. The sounds have caused a great deal of disconcertment among those who have witnessed them, particularly as the noises are said to go on for quite some time, even lasting hours on some occasions. Naturally, this incredibly unusual phenomenon has sparked some theories as to what might be causing the noises. Some have claimed that the noises could be a herald of the apocalypse, given the ghostly trumpeting sounds that tend to accompany them. Others have suggested that it is nothing to do with the supernatural and it is entirely manmade. It has been suggested that the unusual noises could be linked to top-secret governmental experiments conducted by various nations. It has been suggested that the noises could be linked to the HAARP project which is designed to control the weather or that it could be linked to Operation Blue Beam which is intended to produce holograms and bizarre noises in the sky to be used in the context of psychological warfare. However, according to Linda Molten Howe, the answer may be a great deal less alarming than all of that. She has said that it is far more likely that the bizarre noises have been caused by movements within the tectonic plates of the Earth. As these plates shift and settle into position, they make huge groaning sounds which echo and appear to be coming from the sky. More investigation is needed to thoroughly confirm her theory, but it seems as though she may be on the right track. Hopefully, her work can make this unusual phenomenon a little less unsettling for those who experience it in the future.